The St. Simeon Skete Epiphany traditions of blessing all the entrances to every building and taking the Blessed Cross to the River were not hampered by the arctic temperatures in Taylorsville nor did the dangerous subzero windchills deter the practice. 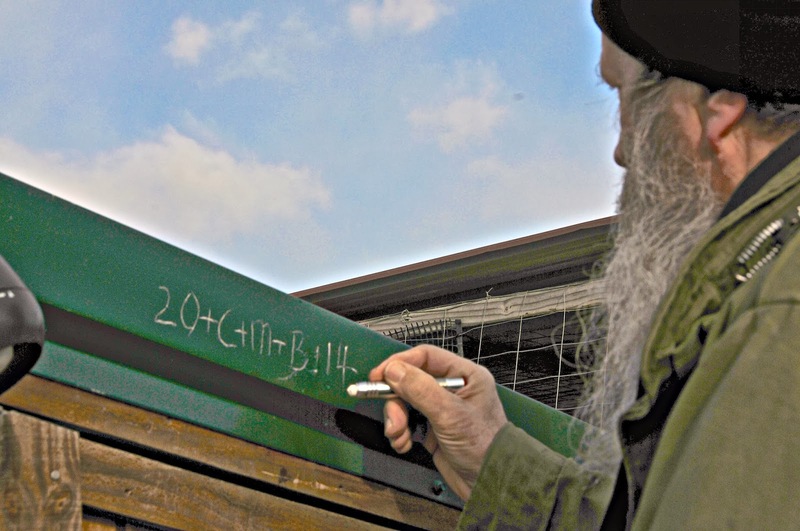 This morning Seraphim packed his bag with Holy Water and Blessed Chalk for the doors and a newly made Cross for 2014 and headed down the steep hills towards to river. 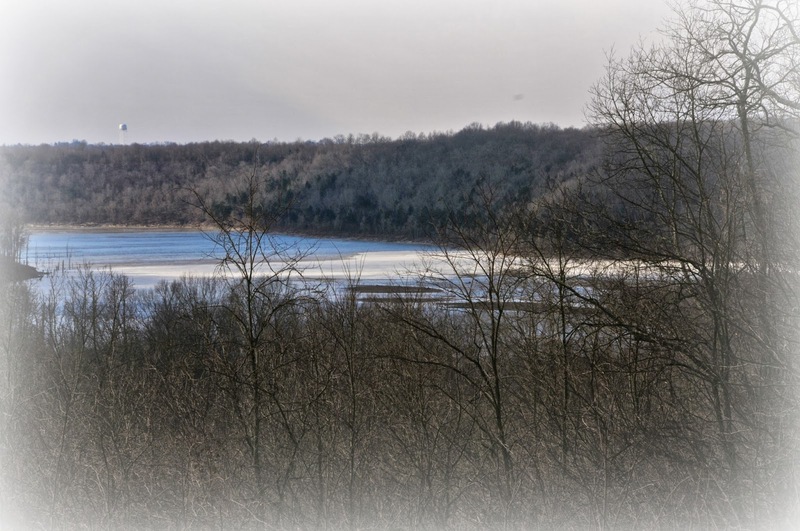 The temperature was hovering between 0º F and 1º F and the windchill was registering -20º. For details on this tradition please click on this link: NHA EPIPHANY TRADITION LINK #1 and NHA EPIPHANY LINK #2. As he headed out, he first blessed the entrances to Anna House. 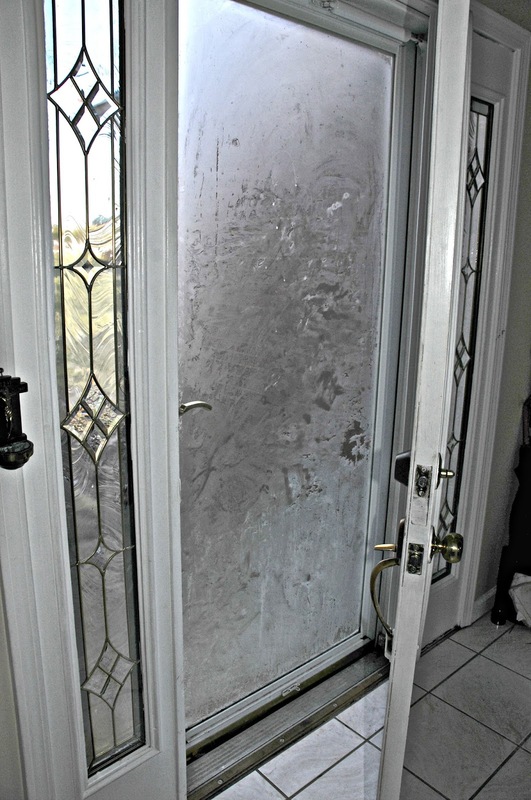 The splashes of Holy Water immediately froze as they hit the door. 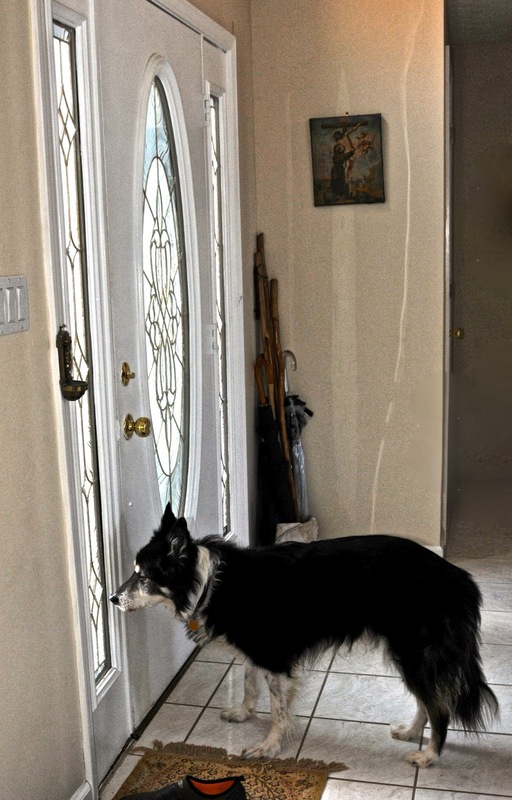 And as Seraphim left, Chase watched feeling a little left out. Because I have Raynaud Syndrome, it was best I didn't make the long hike through the woods to river. So while Seraphim was making his way to the Cave of the Seven Sleepers while praying the rosary and ending up at the River, I found myself shivering in the Chapel. In order to keep costs down, we do not heat the Chapel during the week - just enough to keep pipes from breaking. 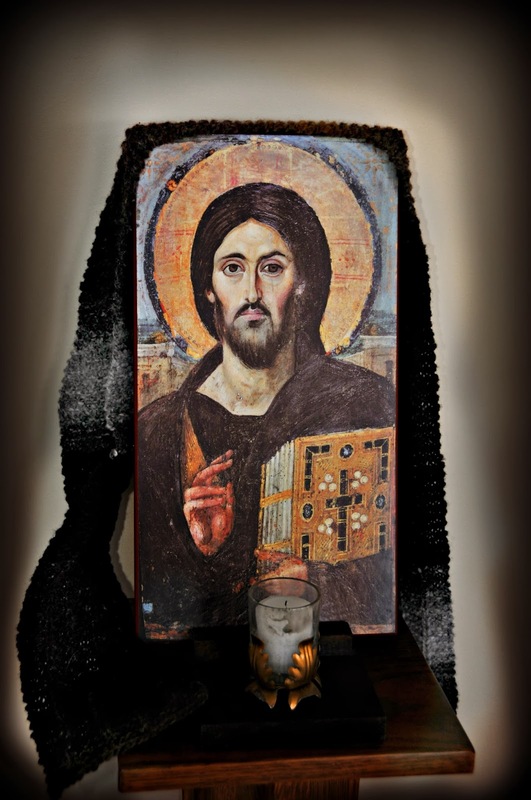 As I began to recite the Jesus Prayer, all bundled up in my scarf, hat, gloves, hoodie and parka; I glanced around at the icons. I smiled as I thought - "even the Icons are bundled up!". However, the scarves around the icon are NOT to stave away the cold but rather they are "bidding towels". 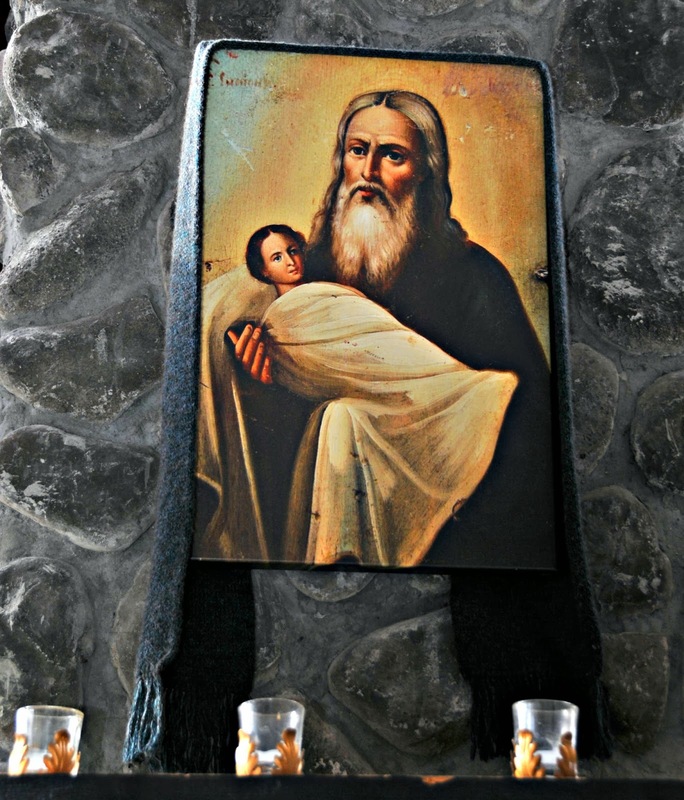 Many years ago in our hermitage in Louisville, Seraphim would place a bidding towel around an icon and pin specific prayer requests onto the Icon Scarf ... or Bidding Towel. The St. Simeon Skete Bidding Towels are "pinned" with prayers for provision and protection of the Skete. In Russia, icon scarves are called rushniks or rushnyk. The very basic rushnyks without designs such as those we use, are informally called utyralnyk or ''wiper" and serves as a towel. The rectangular shape of the fabric indicates a life's journey. In Russia, a rushnyk is given to a baby at birth. 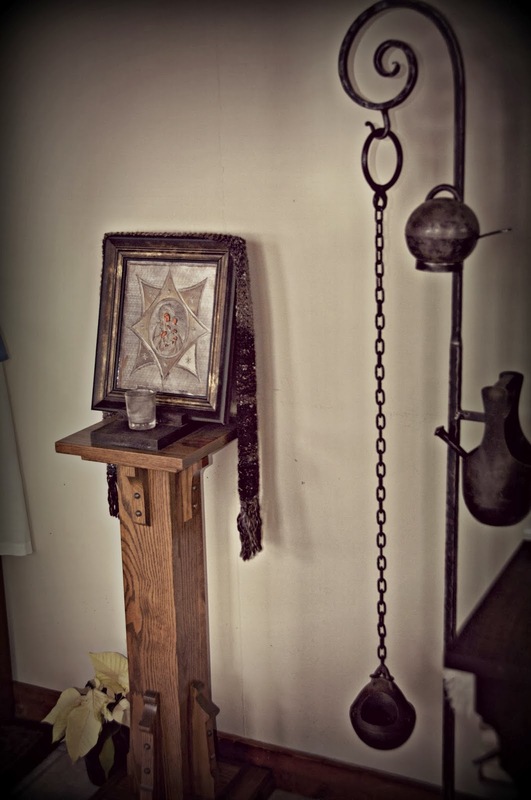 It follows the person, draping icons in their prayer corners throughout their life and used in the funeral service after death. Our icon scarves serve to summon prayer. These "bidding towels" are very special to us and what makes them even more endearing is that these scarves were made by two creative and talented women whose prayers were knitted within every stitch. It used to be that each time I bought myself a new scarf to match an outfit, it would go missing. I never had to search hard or far. I always found it draped over an icon. Seraphim introduced me to Icons (specifically Russian Icons) many years ago and they are very much a part of our "family". 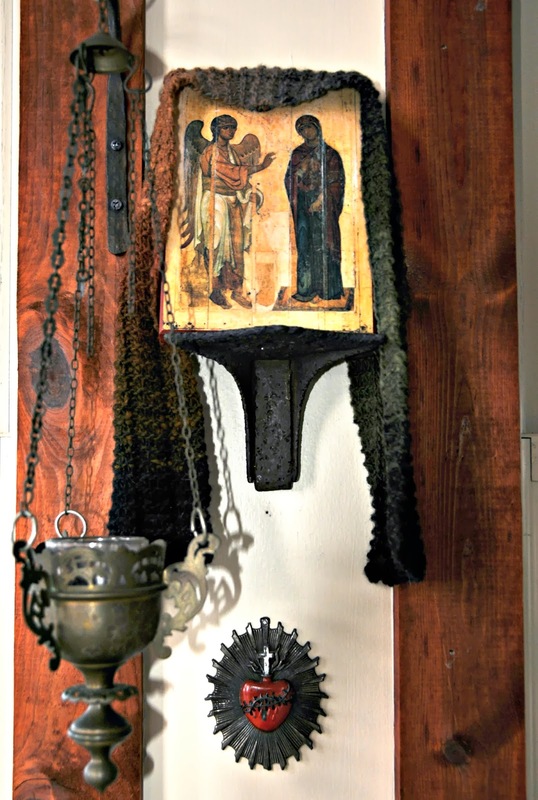 My granddaughter called the icons on the wall of the Sacristy at our previous church, "Seraphim's friends"'. Therefore, I certainly don't mind sharing my scarves with these "Windows into Heaven". (But thanks to these accomplished knitters, I now have the opportunity to wear my scarves again). 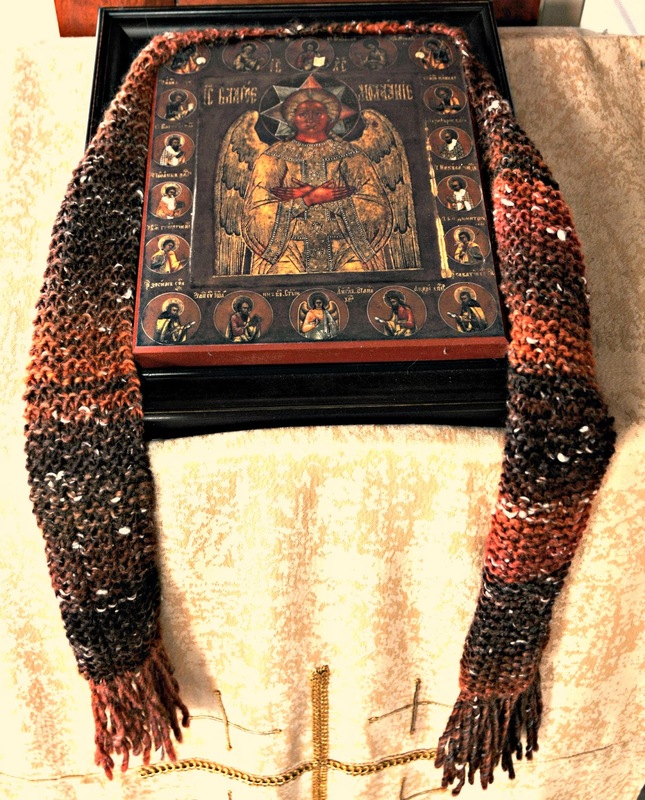 As I mentioned above the "Bidding Towels" or scarves on the icons at St. Simeon Skete were made by two very talented knitters. Nancy Jackson of Magalia, California began the draping of our icons in scarves when she made two bidding towels for the Chapel. 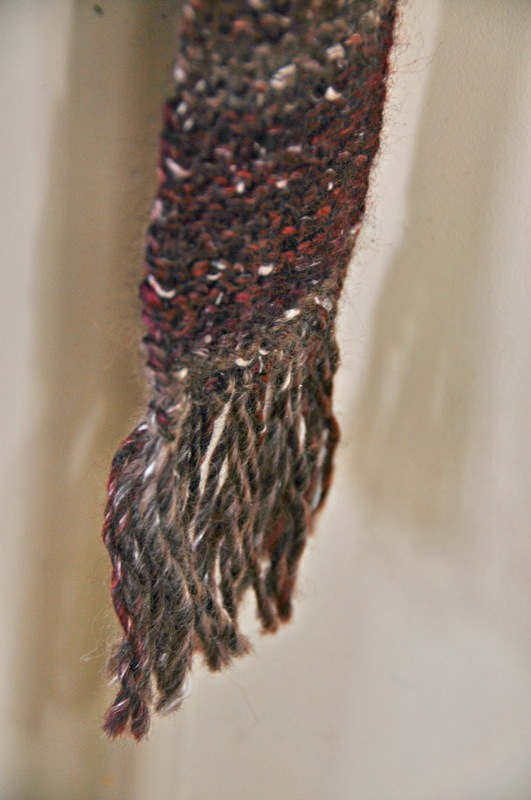 Nancy makes exquisite prayer shawls, each shawl completely bathed in prayer and love. 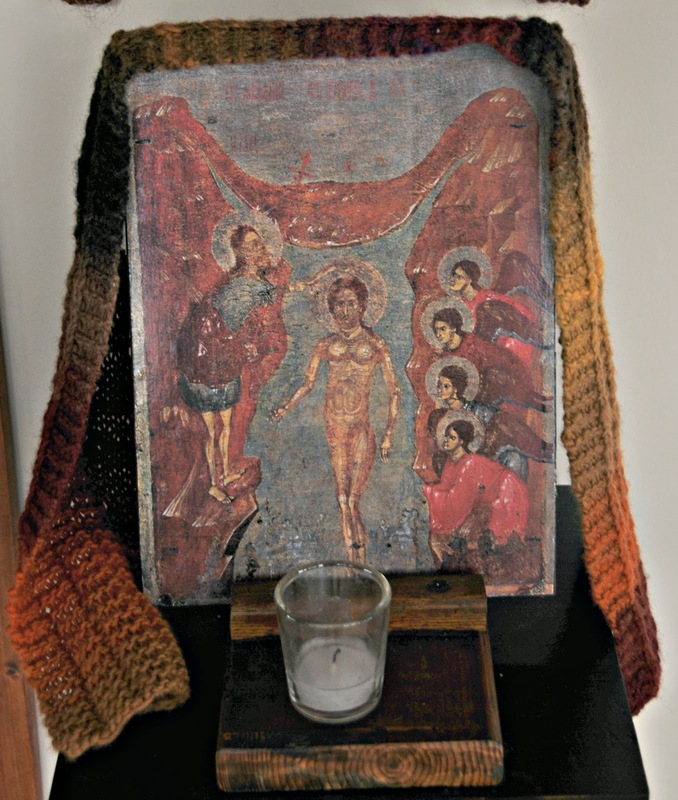 As icons increased in the chapel, Miriam R. Pelikan Pittinger of Madison, Indiana (a member of St. Simeon Skete and part of our choir) diligently knitted a scarf for each remaining icon. Like, Nancy, Miriam is an incredibly talented knitter. 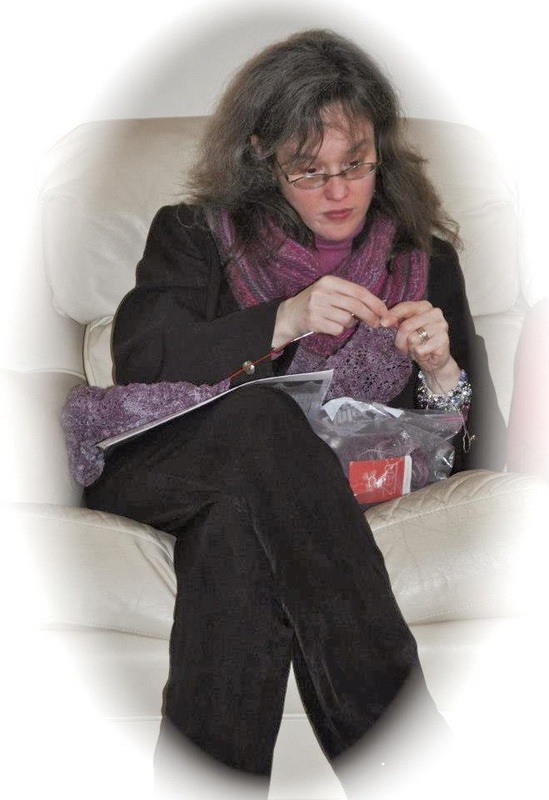 It is a rarity to see Miriam without knitting needles moving through yarn. So today as I waited for Seraphim's return from the river, sitting in the chapel, knitted scarf around my neck, I continue to feel surrounded by friends. And not just any friends, but friends that constantly invite me to pray. As the traditions of Epiphany take place today I recall that Icons are the work of tradition. 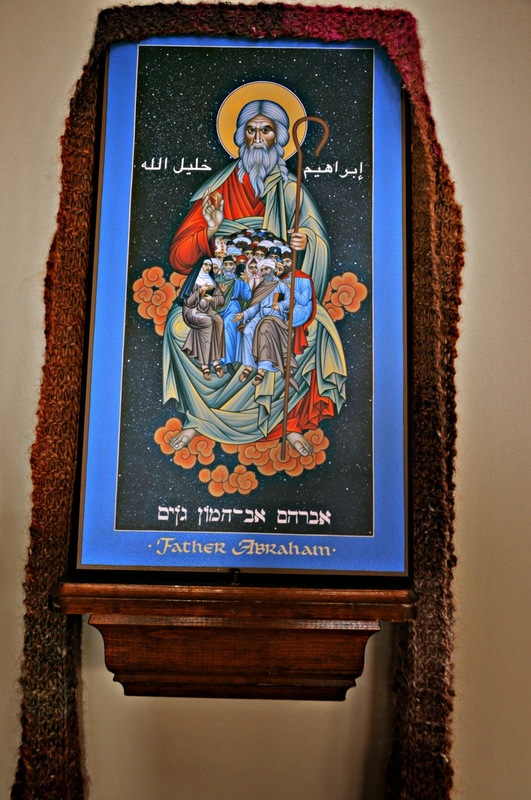 The icon is not only the iconographer's personal meditation but in its portraying of Biblical history passed on by generation after generation, we become united. 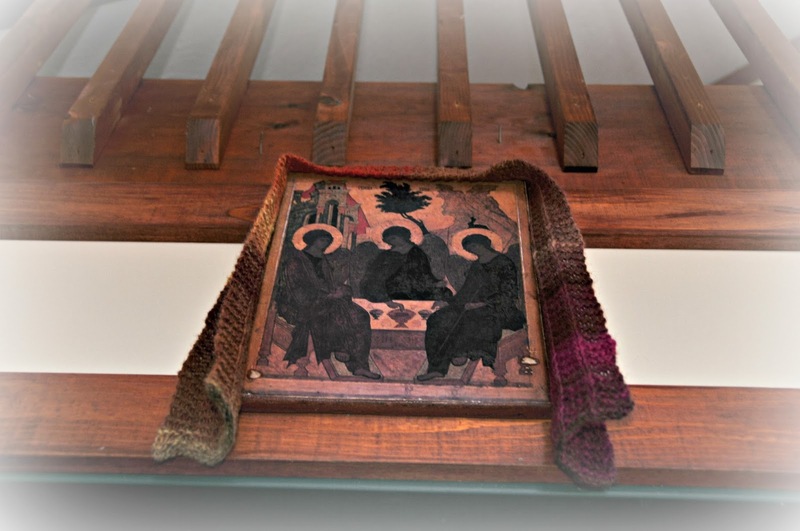 As there was prayer in the stitches of the "bidding towels"; making an icon is a fulfillment of prayer. Fr. 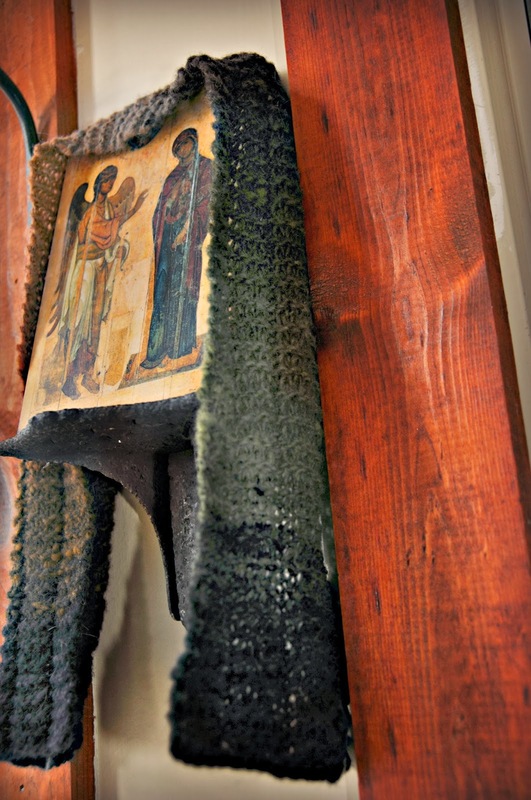 Zinon said of icons in a museum: "They should all be put back in the churches they were taken from." He went on to say, "They are not civil paintings. They aren't for museums. They aren't decorations. They are a reflection that God became man. They are holy doors." pg. 19, "Praying with Icons". As this Feast Day of The Epiphany draws to a close, the traditions at the skete have all been completed. 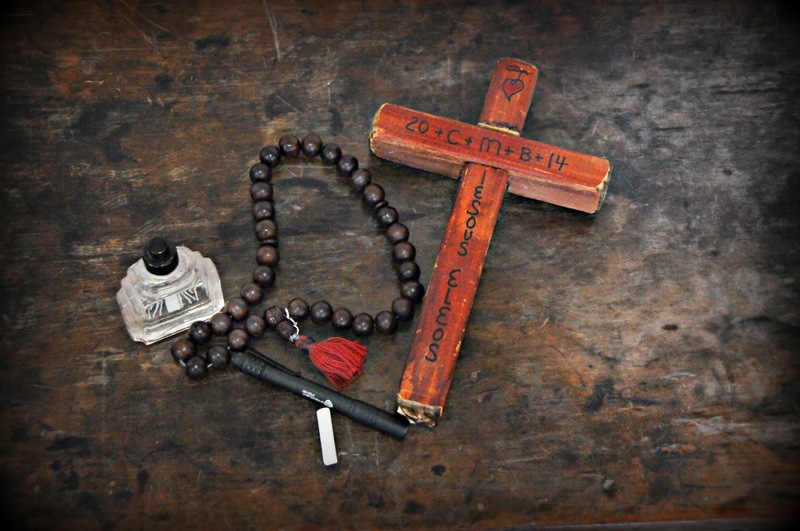 Every door on the property has been blessed, first with Holy Water and then dated with blessed chalk. The Blessed 2014 Wooden Cross is now floating downstream blending into one tributary and the next rendering all waters Baptismal. 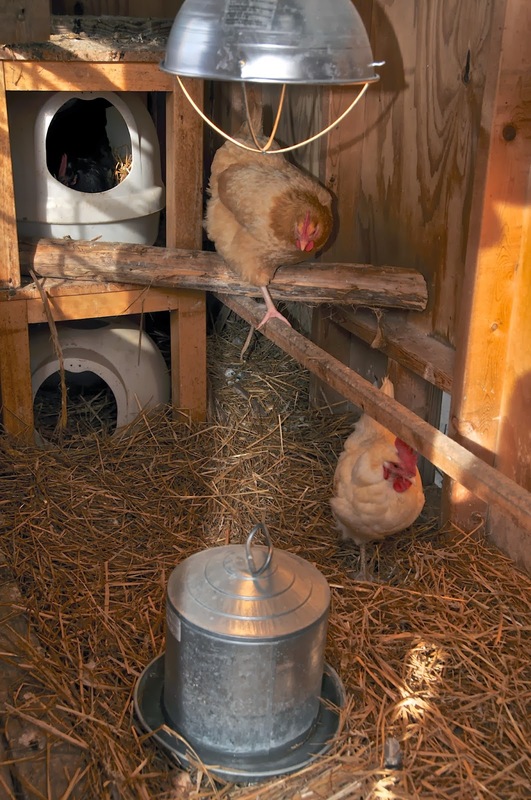 ...The Door to the chicken coop was blessed as well!